Scenic Byway 12 winds along the northern border of Grand Staircase Escalante National Monument. It is a beautiful drive with some interesting places to explore. We spent a couple nights boondocking, so we could see some of the area’s sights. Our first stop was at the Cannonville Visitors Center, where we got some advice about places to boondock and a permit to overnight along Scenic Byway 12 or the Burr Trail. We found a place to pull off Highway 12 about 10 miles from Cannonville. The next day, we drove back to hike in Kodachrome State Park and see Grosvenor Arch. Kodachrome State Park is about 9 miles south of Highway 12, and charges a small day use fee. We spent an enjoyable day hiking the park’s Panorama, Cool Cave, Shakespeare Arch and Nature Trails. We also saw Grosvenor Arch, a double arch (with a third arch around in back of the main double arch). To get to Grosvenor Arch, take Cottonwood Road (dirt road) down about 11 miles from the entrance to Kodachrome State Park. If you are interested in a longer drive down a dirt road, Cottonwood Road continues all the way to Route 89 on the south side of Grand Staircase Escalante National Monument. We had already done some exploring on the southern side, including the lovely area around the Paria Movie Set, so we were content to just drive a few miles south of the Grosvenor Arch turnoff. The next day we drove further along Scenic Byway 12, stopping at the Escalante Visitors Center. In addition to viewing the exhibits here, we also got a specific suggestion on where we could boondock: about 6 miles down Burr Trail, a road that heads southeast off Scenic Byway 12 near the town of Boulder. Once situated in our boondocking spot, we took the car on a drive down Burr Trail. A scenic backway, the 66-mile Burr Trail starts in Boulder and ends near Ticaboo and the Bullfrog Marina on Lake Powell. It is improved on both ends, the exception being 10 miles within Capital Reef National Park and 11 miles south on BLM land. We went down the paved section from Boulder (30 miles or so) and continued on graded dirt down to the bottom of the impressive switchbacks. It was time well spent. The first several miles are picturesque farmland. Then you drive into dramatic Long Canyon, and soon after, you will come across great views of the Waterpocket Fold. The following day, we drove back toward Escalante and hiked the Calf Creek trail to the Lower Falls. This is about a 6-mile round trip hike, to the falls and a lovely little pool where you can take a dip to cool off. This is a worthwhile hike. We also took a drive down Hole-in-the-Rock Road to see the rock formations at Devil’s Garden. While Devil’s Garden is interesting, if we had it to do over again, we wouldn’t bother making the 12-mile ride on a dirt road to get there. By the way, the drive on Scenic Byway 12 from Escalante to Boulder and then on to Torrey has some awesome views along the way. Some pullouts are suitable for an RV, but use care if you choose to take a peek. The road winds through part of the Dixie National Forest and across Boulder Mountain. The road has sections with long climbs and descents, at an 8% grade or more. We did in our 40-foot motorhome with car in tow. Just proceed with care on the winding road. Other places of interest off Byway 12 include dirt roads such as Hell’s Backbone, Posey Lake, Pine Lake, Anasazi State Park Museum and Escalante Petrified Forest State Park. More details can be found by asking at the Visitor Centers, where you can also pick up a copy of the Scenic Byway 12 Route Guide and the Grand Staircase Escalante National Monument guide. We then took Scenic Byway 12 to Route 24 east to Capitol Reef National Park. has to offer and save money too. 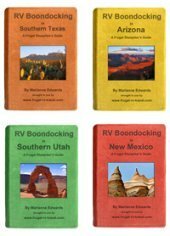 These RV publications tell you where to find these places, so you can enjoy the wonderful experience of boondocking.